For your convenience, a starter kit is provided in the unit with coffee fixings for the next morning along with shampoo, conditioner, soaps, a sponge and detergent. A shopping center is conveniently located right across from the resort for anything else you may need. 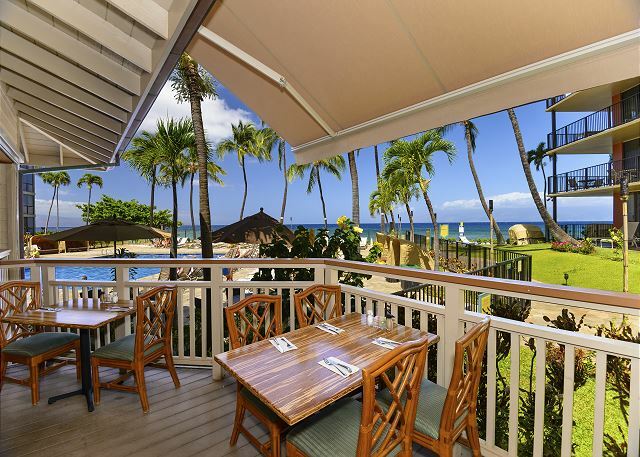 Ka'anapali Shores Resort is located on the most desired beach on Maui. It is truly spectacular! The resort features 463 rooms, including two pools, hot tubs, restaurant and lounge, fitness center and spa, convenience store, tennis and shuffle board. The Garden Pool has been renovated with an array of fun features including a new hot tub, multi-color LED Lighting at night, waterfalls, tropical garden and other aquatic features. Enjoy a refreshing drink at the new Ocean Pool bar before spending a relaxing afternoon poolside. BBQs are for your outdoor fun and cooking right on the beach which makes grilling that much more fun! But it's the beach that keeps guests coming back year after year from all over the world. Restaurants are close by as are all the fun happenings you came to Maui for. Java Jazz is in the shopping center across the street. They have great food and music! There is a new Slappy Cakes to make your own pancakes! Local grinds and pizza as well. 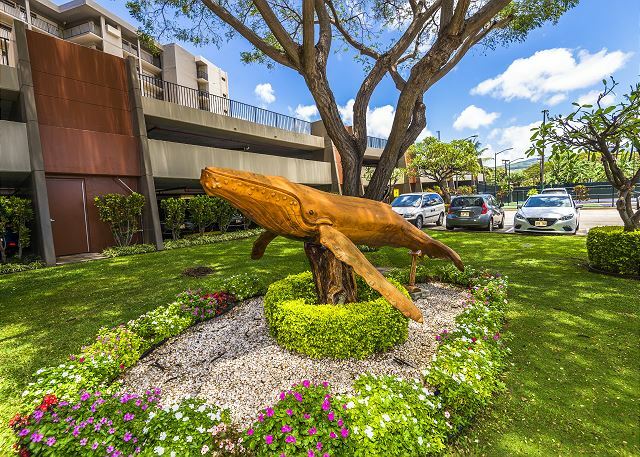 Ka'anapali Shores is a short drive to Luaus, Lahaina Town and Harbor, and Whalers Village for great shopping. Up North are beautiful bays, including Napili and Kapalua Bay, as well as the blow hole and the marine reserve in Honolua Bay. You truly are close to all of the "must dos" on your vacation list. 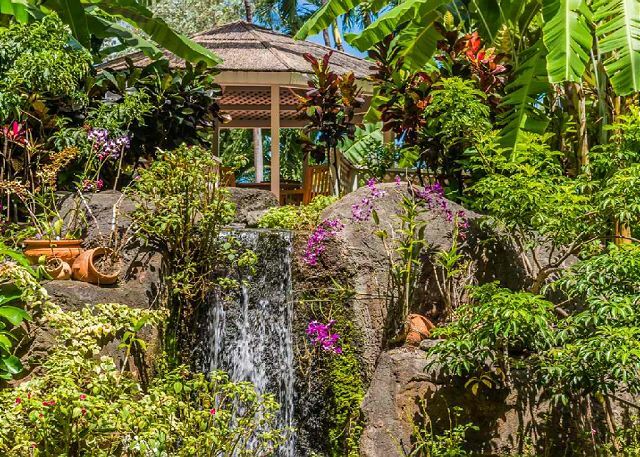 Come enjoy the serenity at Ka'anapli Shores Resort! We look forward to seeing you! 4/5 stars Review by RA-Rosalind K.
Great location and nice unit with beaches nearby. Ocean view was marginal and bathtub room is dated. Too many folks involved in this rental process (travel agent - Red Awning - EPIC) as we did not get any instructions on condo access until last minute (we had to chase down). Next time may go with VRBO to make it simpler! 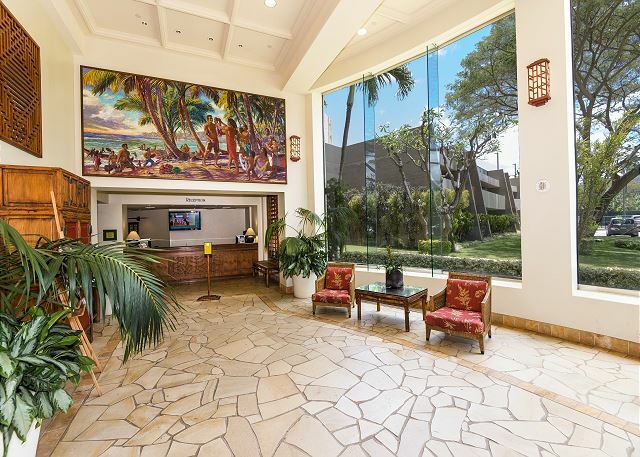 5/5 stars Review by AB-Diane D.
We had a great rental experience at Kaanapali Shores. The unit was undated and easy access to everywhere we wanted to go. 5/5 stars Review by AB - Robert W.
From research to departure, this was a turnkey operation. Support and communications when preparing were flawless. The room was everything we hoped it would be. We chose this over an all inclusive in order to give us the flexibility we wanted and were not disappointed. The property manager was a fantastic help and was always available before and during the stay to help with our adventure. Thank you. A truly memorable experience! The condo we stayed in was a corner unit, with a view from afar of the water, it was quiet, beautiful and had everything but a washer and dryer. We loved our time and the two pools at the facility were great. Once we found the beach walk, that wound in front of some of the hotels and then through the park to the boardwalk area we were able to walk all the way down to the south to the Hyatt for the luau, comfortably (45 minute walk). 5/5 stars Review by Tamara E.
5/5 stars Review by Ruth F.
4/5 stars Review by Bruce D.
Apartment was very clean except the floors needed a more thorough wash. Had all the utensils you needed. Only real complaint was that they need more towel bars in the bathroom to hang up wet towels and bathing suits. There is plenty of room in the bathroom to add more towel bars. Only other issue we had was that we expecting a lock box when, in fact, the passcode actually unlocked the door and the keys were inside the suite. Manager confused us by giving us lock box instructions. Overall, though, we enjoyed our stay in this suite. Hi Bruce, Thank you very much for your feedback. We will look into adding more towel bars to the unit and ensure the floors are deep cleaned. Our sincere apologies for the confusion on the lock box. Please let us know if you plan to visit Maui again. We would love to accommodate you again! Best regards, Epic Realty LLC. Not bad overall. Could be better cleaned & needs more towels. 4/5 stars Review by Olga M.
This property is nice enough to stay a week. Does not have good maintains on a daily basis and was not very cleaned when we got there. We could not get clean towels because there were no daily cleaning service involved and no explanation on what to do to get it.We used friend's service at different condo on the same flow to exchange for fresh towels. 5/5 stars Review by Irene H.
This is the first time we ever used a vacation rental, and Stacey made our experience one of the best getaways we've ever had! She goes above & beyond, and we are looking forward to our next booking with her. The location was ideal- close to so many favorite spots! The room was clean & all of the staff at the Kaanapali Shores was so friendly & kind. It made our vacation perfect in every way!! 4/5 stars Review by Tiare P.
Very pleased and want to stay again. Location was convenient, the hotel had a lot of amenities, and the room was clean. The only thing was, there was no rice cooker. I had to jog my memory for cooking rice on a stove top. Lol! Overall, we really enjoyed it. 4/5 stars Review by Christopher B. We absolutely loved our stay at Kaanapali Shores. Everything was conveniently close to us and within walking distance. Our room was clean and quiet. We loved how friendly everyone was which just made this vacation even better. I am hoping we can return very soon in the future! Thank you! 5/5 stars Review by Melissa T.
My partner and I really loved our stay at Kaanapali Shores. This is was our first time using HomeAway. The location was perfect to all the spots we wanted to check out. Property was clean and well maintained. We didn't get to use the pool because we were too busy checking out the beaches. I would definitely recommend this place to someone else. Our favorite part of our trip was Road to Hana. Nice, but could use a thorough cleaning. The location of this resort is perfect. There is a store across the street, a fish market a couple blocks North, beaches within walking distance... no complaints on the location of this resort at all! We ultimately loved our trip and for the money, this unit is in decent condition. However, there are a couple things that would make it a little more comfortable. There are ants in the cupboards in the kitchen and around the bathtub. The shower curtain liner is mildewed (needs to be replaced). The kitchen cupboards and stove top need to be seriously cleaned. The bathroom needs to be updated, but I don't expect these updates for the price we paid to rent the unit. But the cleanliness is something to be expected no matter what. Overall, I was happy with my stay and was able to look past the downfalls due to the perfect location. 2/5 stars Review by Diane B. If your looking tfor ambience this would not be the place to settle. The location is one where you can hear the trucks and maintenance crews just outside the balcony. Your oceanview is a sliver of the pacific from quite a distance. The entry to this unit is dismal and the unit needs some TLC. It is tired looking. In addition, you will not find any place to store your clothing or belongings as there are no dressing. The unit manager is very attentive make up for the mediocre accommodations. I recommend spending a little bit more to enjoy your holiday. 5/5 stars Review by David T.
Mahalo Maui - fun time! 4/5 stars Review by Georgia S.
Rental experience was very satisfactory. The title on this review indicates $100 a night, which is not accurate. We were there in January and for 9 nights, it was $2,400. The rates apparently vary by season. Property Management company was great. We were given great instructions and they were in touch and very helpful and made our visit smooth. The property was clean and the kitchen and closet full of beach items was great. The resort staff was great! Positive for the most part. Lulled to Sleep by trade Winds! 4/5 stars Review by Alan H.
My wife and I enjoyed our stay very much. Our only constructive comments are as follows and are ultra picky so please remember as you read this we Had A Lovely Time and happy hour by the pool is something not to be missed! !And the title of this review is so very accurate. The winds blow at this end of the island more consistently then in Kehei and at night you will love how pleasant the winds are for sleeping.Constructive Comments:1) A written description of the responsibilities that exist between the private rental and the Hotel. As we discovered the hotel has very little to do with the room set up including the phone. All the connections to the front desk e.t.c. are not hooked up. My only concern regarding this was safety. What to do/ who to call in an emergency. With whom lies the responsibility? I would suggest that any guest ask for the phone to be hooked up. I discovered this our last couple of days. All you have to do is ask the front desk and they set it up with a push of a button.2) We did not know where to put the full garbage bags. Is there a garbage disposal we should use? 3) Is there an onsite laundry unit in the hotel?Loved it and highly recommend staying in this unit. 5/5 stars Review by Lisa S.
I rented a studio unit about 2 months before my vacation. It was the last one available in the complex so I wasn't sure what to expect though the pictures looked good. I was very pleased when I arrived. The unit was clean, comfortable and looked like the pictures. My only suggestion is that it was about time to replace or wash the shower curtain liner. Also, this unit doesn't really have much of a view. You can see the ocean a little in the distance over a building. I was more concerned with finding a place in the complex because I was traveling with a group than getting a unit with a view. 5/5 stars Review by Jay M.
Unit was clean and well maintained. Location and staff were great. Overall great experience! My husband and I are recently retired and one of the first things we wanted to do was to go to Maui and live for a month, without the tourist experience. This vacation was perfect for what we wanted. For the most part we were very satisfied with with this studio and were very satisfied with the resort. The size of our unit was perfect for us and we loved the new bed. We could tell that the tile floors in the kitchen and bathroom have been recently updated and we appreciated the nice granite counter tops. The main downside was however, in the first day or two of our stay, we couldn't figure out why the bottom of our feet were so black--turns out the hardwood and tile floors were not very clean, which I promptly fixed with a couple of scrubbings. It also looked as though it hadn't been dusted in a while, but all in all, easy things for me to fix. The appliances were clean and nicely updated. 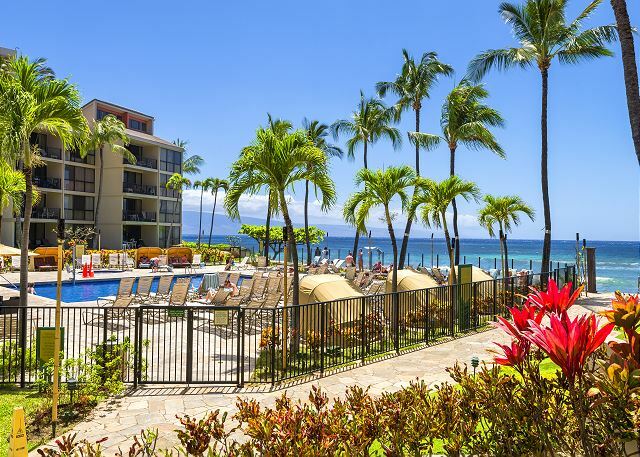 The Kaanapali Shores Resort is very centrally located and the resort is very well maintained with very friendly and helpful staff. We were within walking distance to great restaurants, grocery, and easy access to the boardwalk. We feel the studio unit is located perfectly for a 1-2 week stay, but since we were there for a month and spent quite a bit of time there, the location of this unit may not have been perfect for us. We slept every night with the sliding door open to take advantage of the wonderful breeze, but there was quite a bit of early morning noise. Directly below the unit there were daily morning deliveries, and the garbage/recycling area from the resort next door is located a few yards away, with garbage pick-up every morning. Epic Realty was wonderful to work with.The renting of the unit was seamless and they did a wonderful job of keeping us informed along the way. We will definitely go through Epic Realty on our next vacation. 5/5 stars Review by Airbnb Janie L.
The room was a little far and the lanai was not in a good location. The resort it self lacked useable beach access. 5/5 stars Review by Darren M.
This was my wife's first trip to Maui and my second, we are a low maintenance couple and suite #642 at the Aston Kaanapali Shores Resort more than met our expectations. It was clean and comfortable, and a great place to unwind at the end of another long, adventurous day. The kitchen layout was very functional, with many of the basic items already provided. The living area was simple and tidy, and the murphy bed was a surprisingly comfortable sleep. The bathroom could maybe use a little updating but again it was clean and served our needs just fine. There were two Tommy Bahama folding beach chairs in the closet (everyone in Maui seemed to have them) which allowed us to lounge comfortably on any beach we wanted to enjoy, and if chairs aren't your thing two large complimentary beach towels were provided in addition to the towels that were already provided by the resort itself. The suite didn't have a washer/dryer but the resort had machines available which did a great job for a total of about $2.25. Our contact Helen from Epic Realty LLC made the booking process really simple, she sent us directions to the resort along with an app that would allow us to access our booking agreement, check-in and check out procedures, things to see and do, nearby restaurants and recommended establishments. We were also contacted by a concierge who would help us book experiences for our trip. We chose not to use this service but it was nice that it was provided. 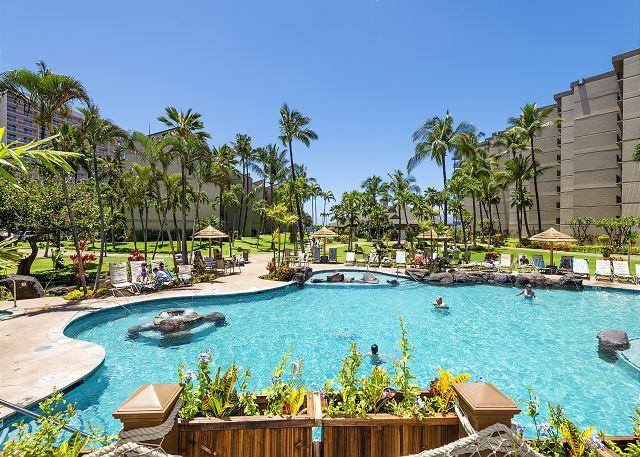 The staff at the Kaanapali Shores were wonderful, we had access to all of the resort amenities, and they treated us with the same high quality that they provided to all of the their other guests even though we were staying in a privately owned suite. We plan to come back to Maui again next year and would not hesitate to rent suite #642 again. If you want a nice stay and don't want to pay for the high prices at some of the other hotels this is the place for you!!! What are you waiting for? It's Maui. 4/5 stars Review by Janice N.
Location is very convenient to restaurants, shopping, Lahaina, etc. Property was clean and in good shape. Use of hotel pool and towel service was very convenient as there isn't much of a beachfront. Had to use hotel lobby for WiFi. No key for room safe. Unfortunately, weather was too cold to make use of the balcony. Accommodations were very basic and adequate for 2 people (would be very crowded for 4). Loved the location and the attached hotel had good amenities that could be accessed such as parking($9.00 per day), pool, towels, fitness center ($10.00 per day), restaurant.No room safe available and minor maintenance required on doors and locks. Appliances all worked although TV and coffee pot very dated. Great location close to grocery store, beaches, beach walk, snorkelling, etc. Also, ocean view was very minimal as the unit is at the far end of the property and angled to look over a parking lot and another hotel. Air conditioning worked really well. Beautiful island! It's hard to be disappointed by anything in Maui. This little studio condo is charming. There is a tiny view however if a view is extremely important to you than you'll want to look for some place else, and of course pay more. However, our intention was not to spend lots of time in our room. This spot is perfect for an active couple or group of four who intend to get outside and explore the island. The kitchen is equipped with everything you need if you want to prepare all of your meals. We didn't really do that. We made coffee and ate fruit & yogurt in the morning, stored picnic foods for the afternoon and ate out most every night. If you're on a strict budget than prepare your own meals. Eating out gets expensive. The floors were sandy when we arrived so I had to do a thorough sweeping cause we wanted to walk around barefoot and not climb in bed with sandy feet. Nice, comfortable place. 5/5 stars Review by Melissa R.
The studio was a great size for my husband and I. The room had everything we needed. I cooked breakfast every morning and ate outside on the balcony. Although the scenery wasn't the best, it was my favorite way to get up in the morning! The bed is not so comfortable, but it wasn't bad. we would definitely stay here again! 5/5 stars Review by Catherine O. Everything is beautiful in studio #642, it's very clean, full equiped, quiet, modern. We really enjoyed our stay, we recommand this place to everyone. The resort is also amasing, the garden and the pools are perfect! Thank you for this wonderful moment, we'll come back for sure! 5/5 stars Review by Robert B. My wife and I celebrated our 30th wedding anniversary and had a great time ! Good resort. Family friendly. Need to have BBQ area at the front of the resort, not at the back behind tennis courts. That was the only disappointment with the property. Might affect our decision to stay there again. Loved staying at this was clean and well furnished and the resort is right on the beach.